Animal organs. Lymphatic system. Atlas of plant and animal histology. The lymphatic system is constituted by the lymphatic vessels and the lymphoid organs (lymphatic nodules, lymphatic nodes, spleen and thymus). Lymphatic vessels contain and transport a liquid known as lymph, which is collected from the tissues and organs of the body and released into large veins. Small diameter lymphatic vessels, or lymphatic capillaries, are mainly found in the loose connective tissue of the dermis and in the intestine mucosa. These ducts are closed at one end, whereas the other fuses with other capillaries to form larger ducts known as lymphatic vessels. In turn, lymphatic vessels join to one another and form larger vessels. Finally, the largest lymphatic vessels release the lymph into the large veins located in the neck, between the jugular and subclavian veins. Lymphatic capillaries are made up of endothelium and a discontinuous basal lamina that makes possible higher permeability than in most blood capillaries. So, lymphatic capillaries are more efficient gathering fluid from tissues. This fluid becomes the lymph, which is a solution with ions and proteins. In the lymphatic nodes and nodules, lymph components meet the cells of the immune system. 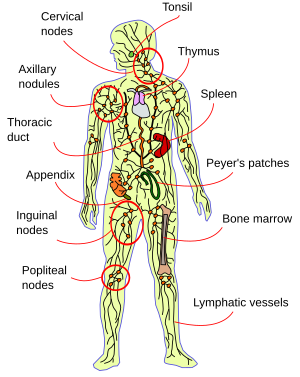 Main components of the human lymphatic system. The major lymphatic nodes groups are encircled. Lymphatic vessels contain layers of connective tissue and smooth muscle cells, more developed as the diameter gets larger. Like in veins, these vessels have valves to prevent the lymph reflux. Because the movement of the lymph through the vessels is not pumped by the heart, lymph is propelled by the movements of the body and of internal organs, i.e., the lymph is driven forward by the muscles of the body. In the lamina propria of the intestine, urogenital and respiratory tracts, there are aggregates of lymphatic tissue mostly containing lymphocytes, organized around lymphatic vessels, and not covered by a connective capsule. These structures are known as lymphatic nodules. They are distributed through the body and altogether form the so-called diffuse lymphatic tissue. Lymphatic nodules are found in strategic locations of the body to be the first defenders against pathogens so that they participate in the early immune system response. Lymphocytes that produce antibodies and eosinophiles are abundant in lymphatic nodules. Reticular connective tissue conatining reticular cells and fibers form the stroma of lymphatic nodules. Structurally, lymphatic nodules are composed of a germinative center where lymphocytes proliferate and differentiate into plasmatic cells for synthesize and release antibodies. Actually, the presence of a germinative center means that an immune response is in progress. Surrounding the germinative center, there is a peripheral zone, known as mantle or corona (cap), with smaller lymphocytes. Besides the location in the mucosas, lymphatic nodules are abundant in the appendix, in the tonsils and in the Peyer's patches of the ileum. Lymphatic nodes are kidney-like structures covered by a layer of connective tissue or capsule. They are located in the path of lymphatic vessels, between the tissues and the large veins. The size of lymphatic nodes ranges from a few millimeters to two centimeters. They are abundant in the axilla, inguinal region and mesenteries. Drawing of a lymphatic node. The lymphatic node is divided into an outer part or cortex and an inner part or medulla. In the outer cortex, B lymphocytes are organized in nodules o follicles, that can be either primary follicles (with a germinative center) or secondary follicles (without germinative center). Deeper to the follicles, there is a region known as paracortex, where T helper lymphocytes are abundant. The central part of the lymphatic node is known as medulla. It contains lymphatic tissue organized in the so-called medullary cords separated by medullary sinuses. There is also a supporting scaffold of reticular tissue. Lymphatic tissue is mainly constituted by lymphocytes, macrophages and plasma cells. Lymph filtration occurs while lymph goes through ducts and sinuses in lymphatic nodes. First, lymph enters the lymphatic node crossing the capsule through the supbcapsular, marginal and cortical sinuses. From here, lymph is gathered by the trabecular sinuses and after that by the medullary sinuses. The endothelium of the these sinuses is discontinuous in the areas where it is in contact with lymphatic tissue. From the medullary sinuses, lymph is collected into the efferent lymphatic vessel that quits the lymphatic node by the hilium. Lymphatic nodes are major places for phagocytosis and for the start of the immune response. Lymph transports migrant dendritic cells to lymphatic nodes. These cells can initiate the immune response, but resident dendritic cells located in the cortex of the nodes can initiate the response too. Both are antigen presenting cells and induce the activation of B lymphocytes in the transition zone between cortex and medulla. Activated lymphocytes migrate to primary nodes and proliferate to form the germinative centers, so that primary follicles become secondary follicles. These lymphocytes differentiate in memory B lymphocytes and plasma cells. Both move to the medullary region of the node. Later, most of the memory B lymphocytes quit the lymphatic node and colonize other secondary lymphatic organs to produce clones. About 90 % of plasma cells also leave the lymphatic nodes and go to bone marrow to produce antibodies. Thymus is a lobed organ found above the heart and before the large blood vessels. It develops from the pharynx endoderm. The main function of thymus is done in the period included between birth and puberty, and is a place where T lymphocytes mature. After puberty, the thymus lymphatic tissue is replaced by adipose tissue. Thymus is covered by a capsule of connective tissue. In some parts, this layer protrudes inward dividing the organ in uncompleted compartments known as lobes. Thymus lobes are constituted of thymic parenchyma, which can be divided in two parts: cortex and medulla. Cortical parenchyma contains many developing T lymphocytes, also known as thymocytes, macrophages and epithelial-reticular cells. In the medulla there are T lymphocytes as well, but there are more loosely distributed. Medulla appears more clear after general staining. Blood vessels enter the thymus through trabeculae. These vessels have a sheath of connective tissue. T lymphocytes do not contact directly with blood because there is a barrier, known as blood-thymus barrier, made up of endothelium, macrophages and epithelial-reticular cells. The largest lymphatic organ is the spleen. It performs hematopoietic and immune functions. Spleen is heavily irrigated by the blood system, which has two functions: mechanical and immune filtration. It contains many lymphocytes, macrophages, reticular cells (which form a kind of net), as well as non-cellular spaces and vascular ducts. Spleen is wrapped by a capsule of dense connective tissue that send trabeculae to the interior of the organ. This connective tissue contains myofibroblasts with the ability of contraction. The spleen can store large amount of erythrocytes, which are released again to the main vessels by the contractions of myofibroblasts. 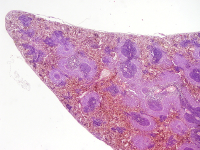 The spleen pulp, or spleen parenchyma, is the inner part of the organ, which is not connective tissue. There are two types: white and red. White pulp contains many lymphocytes arranged around the central artery, forming a sheath known as periarterial lymphatic sheath (PALS). The red pulp contains many erythrocytes and vein sinuses.